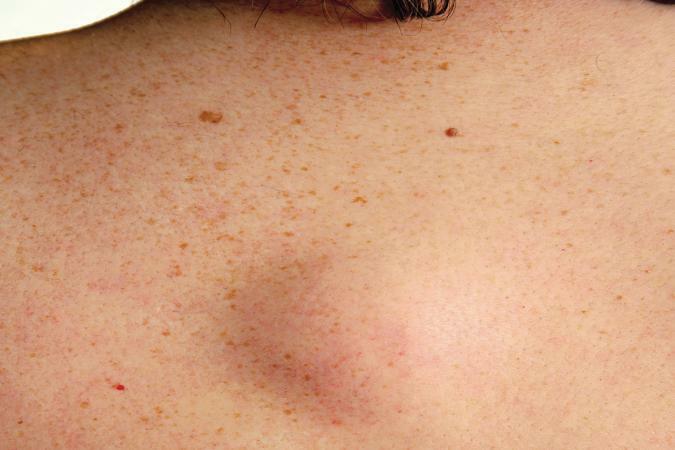 Small bumps on the back could be a number of different things, like a skin tag, lipoma, a skin cyst or a skin abscess. They're rarely cancerous; however, it helps to know what to look for. 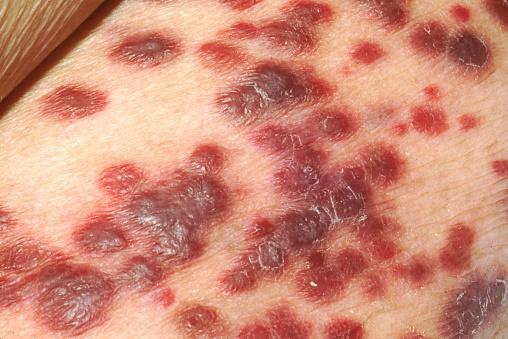 Cancerous bumps (called sarcoma) will usually produce warning signs. There are noticeable differences between harmless lumps and bumps on the back and sarcoma (a cancerous bump). In the case of a non-cancerous back bump, it's recommended that you follow the RICE method of rest, ice, compression, and elevation. Even though the lump or swelling might grow large and painful with activity, it should diminish in size with rest and improve over time. Sarcoma can occur in any part of the body, including the back. As sarcomas can occur in flexible, elastic tissues or deep spaces in the body, the growing tumor tends to push normal tissue out of its way. This causes a bump; however, it might grow fairly large before it starts to become worrisome. It can especially cause pain when the tumor reaches a certain size and begins to press against nerves and muscles. There are a variety of types of small, common sarcoma bumps that can occur on the back. Fat tissue tumors - These are sarcomas that start in the body's fat cells and can grow anywhere in the body, but they most commonly affect people aged 50-65. Smooth muscle sarcomas - These can develop in smooth muscle anywhere in the body, but especially in the back of the abdominal area. Skeletal muscle sarcomas - Skeletal muscles are the active muscles that control the arms, legs, and other parts of the body. This type of sarcoma mostly occurs in the head and neck. Peripheral nerve tumors - These can occur in the cells that cover the nerves anywhere in the body. Fibrous tissue tumors - Fibrous tissues join muscles to bones. This type of sarcoma is more commonly seen in people aged 20-60 in the arms, legs, chest, or stomach, but it can also be seen elsewhere in the body. Blood and lymph vessels tumors - These begin from the cells that make up the walls of blood or lymph vessels and can occur anywhere in the body. There are additional types of sarcoma back bumps according to Macmillan Cancer Support, but they are extremely rare. Make sure that you seek medical advice straight away if you have any symptoms of sarcoma. Other warning signs include a red, hot or hard lump that either won't go away or grows back after it has already been removed. There are a multitude of treatments available if you do receive a sarcoma diagnosis. A small bump on the back can be several different things, including sarcoma. It can be worrisome if you've never experienced a lump like it before or it's causing you pain. If ever in doubt, it's best to visit your doctor so that you receive the proper care and attention.